A young American soldier stationed in Reykjavík, Iceland finds himself mysteriously transported nearly a thousand years into the past. Gerald “Samsson” Roberts is befriended by Ospak Ulfsson and his family and soon discovers that his modern day skills don’t translate well to the 10th Century. Intent on earning his keep, Gerald takes on a number of menial jobs. Many considered by the Vikings to be fit only for women. When Gerald becomes the focal point of a family feud between rival clans he is forced to fend for himself with tragic consequences. Writer Poul Anderson is no stranger to the time travel genre having written a number of books and short stories including the Time Patrol series featuring Manse Everard, a time patrolman whose job it is to fix historical anachronisms. In 'The Man Who Came Early', Anderson demonstrates his detailed knowledge of Scandinavia and Viking lore while portraying a very different kind of time traveler that SF had seen up until this point. Previous time travelers like Mark Twain’s The Boss in “Connecticut Yankee in King Arthur’s Court” or Martin Padaway in L. Sprague de Camp’s “Lest Darkness Fall” sought to use their advanced knowledge to modernize the past and gain the upper hand. In “The Man Who Came Early”, Gerald Samson ends up discovering that not even his modern conveniences of matches can impress the Vikings. He brought out a small parchment box and from it took a little white stick that he put in his mouth. The he took out another box, and a wooden stick from it which burst into flame when scratched. With the fire he kindled the stick in his mouth, an duscked in the smoke. We all stared. "Is that a Christian rite?" asked Helgi. "No . . . not just so. "A wry disappointed smile twisted his lips. "I'd have thought you'd be more surprised, even terrified." "It's something new," I admitted, "but we're a sober folk on Iceland. Those fire sticks could be useful. Did you come to trade in them?" The author's choice of narrator in the story is also unconventional. Typically the time traveller is the point-of-view character, which allows the writer to juxtapose the time traveller's historical/cultural frame of refernece with an unfamiliar one (usually a historical one) but in The Man Who Came Early, the narrator is Ospak Ulfsson, a viking patriarch who befriends teh wayward traveller stranded in time. What is even more telling is Anderson's choice to have Ulfsson tell his tale to a priest about his strange encounter with this 'American' from another time. A bold choice that somewhat weakens the plot. The author's choices are not coincidental by any means. The fact that Gerald “Samsson” Roberts is being talked about in the past tense suggests to the reader right up front that he is no longer a part of the story. In fact the pivotal scene in the story is played out on the cover of the anthology in all it's pulp glory. Perhaps not as memorable as some time travel short stories of the same period, but definitely one that broke with convention and dared challenge the archetypes of the genre. This Poul Anderson page has a brief bio and complete bibliography including links to cover art and some reviews. Site lists all awards Anderson was nominated for or had won over the years. Also contains references to literary criticism of the author. REVIEW - "The Best From Fantasy and Science Fiction - Sixth Series"
This review over at Mark Watson's BEST SF site gives a brief synopsis of all the stories in the anthology. 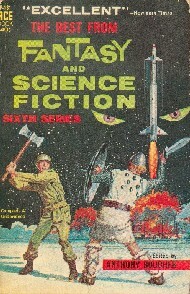 Science and Fiction and Fantasy Writers of America's tribute page to Poul Anderson. Contains a page with obituary and tributes from fellow writers, fans and friends. Not exactly related to time travel, but this fantastic essay by Poul Anderson on what's wrong with a lot of Sword and Sorcery Fantasy is still relevant after all these years. It also says alot about Anderson's writing instincts..